Recover in Seconds, Not Hours. Time wasted on recovery means lost revenue. reevert puts a stop to it. Answer the call with reevert. reevert is an intelligent hybrid backup and storage solution, designed from the ground up specifically to protect businesses against ransomware and data loss. It features fast hourly snapshots, safeguards your data and backups, and allows quick recovery. reevert can image servers and computers, protect network shares and local files and offers offsite cloud data backups. There are a million ways you can lose data. In some cases, data recovery is simple, but in others the damage is irreparable. New studies show ransomware attacks are becoming more and more common and will soon become the biggest threat to your data. Traditional backup solutions do not provide a quick and easy path to recover from a massive ransomware infection. Today’s increasingly sophisticated threats require a fresh approach to data protection. 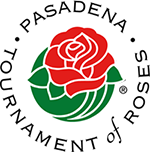 reevert software saves you time and resources. Complete backups and file recovery in just seconds. Backup and recovery is blazing fast whether you have 1MB or 1TB data. Say goodbye to long hours spent running slow backup software. reevert's built-in data compression and dynamic filesystem block size allocation ensure your files are stored in as little space as possible without wasting your storage blocks. An intelligent backup system only backs up the changes in your data set, saving time and disk space. No more redundant data backups wasting valuable storage space. Relax knowing your data is always safe. reeverts creates on-site backups every hour and cloud based off-site backups ensures your data can be recovered even after a major disaster. reevert has an easy to use web based administration panel. You can easily perform your day to day operations and get real time performance status updates. 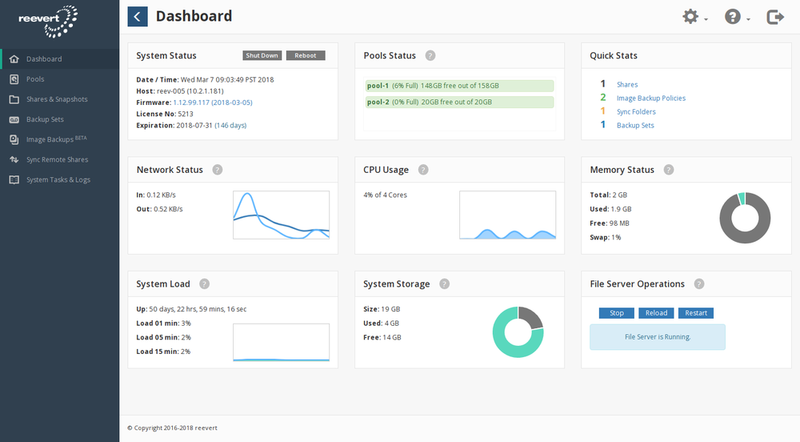 Get a quick overview of your system on the Dashboard. 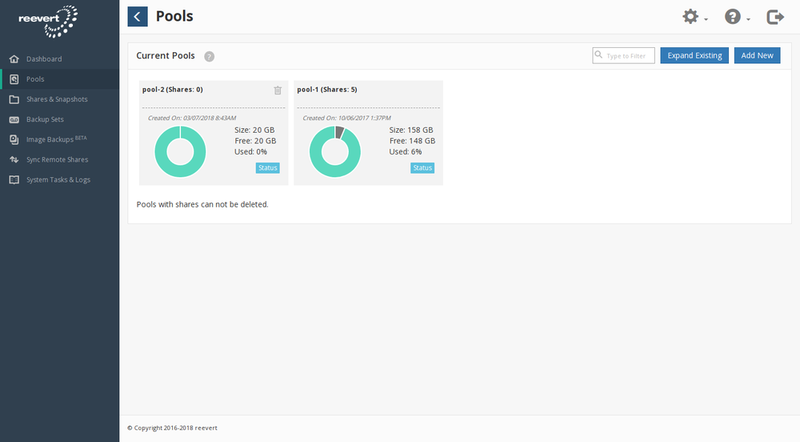 From here you can check the status of your system, from network and processing load to status of pools, and shares. You can also choose to reboot or shut down. Pools are storage volumes created from virtual hard drives. Think of them as high level storage buckets for your data. Manage pools, expand existing pools or create new ones. Monitor their status, and check for any known data errors. Shares are network accessible folders where users can store their data. 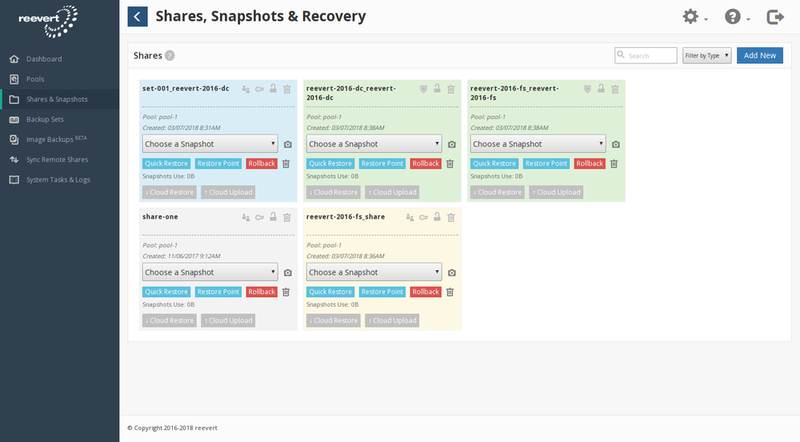 Manage current shares and snapshots. Easily select and restore snapshots. Rollback to snapshots if needed, delete snapshots, or even upload to and restore snapshots from your AWS S3 or Wasabi storage. This agent-less backup system connects to computers and backs up files and folders. It provides hourly restore points that can be used to restore files and folders if need be. Just like shares and Sync Remote Shares, this feature also provides seamless integration with Amazon S3 or Wasabi for off-site cloud backups. 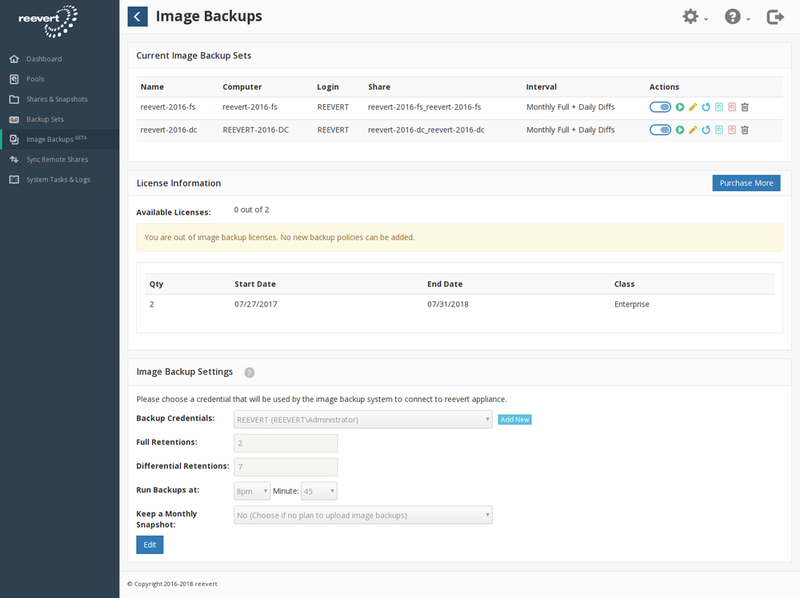 Image backups lets you create full disk images of your network Windows based computers. Backup Physical and Virtual Servers, Workstations and Laptops with cloud based replication. 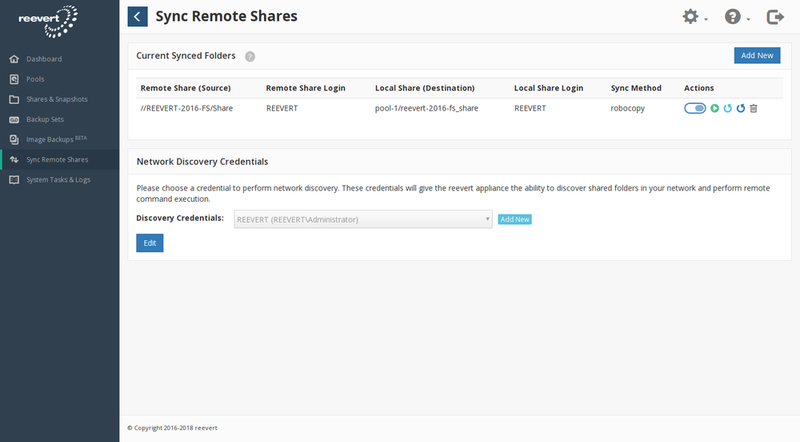 With Sync Remote Shares, you can virtually backup any shares on your network. 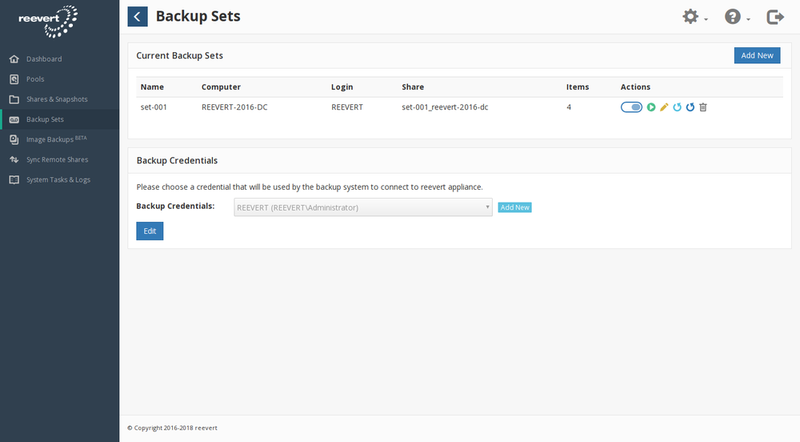 This feature supports computers and NAS devices and Amazon S3 or Wasabi integration is built in. 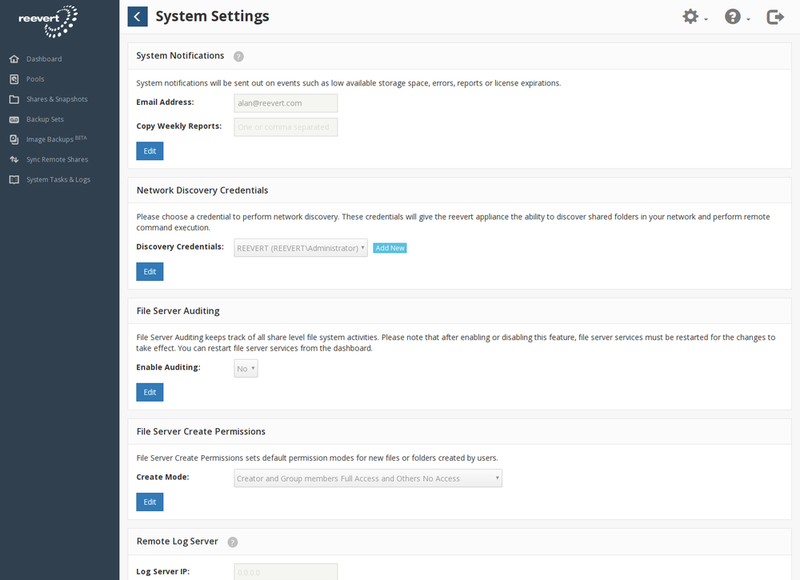 reevert can be configured to connect to your Amazon AWS or Wasabi account and upload snapshots to cloud. 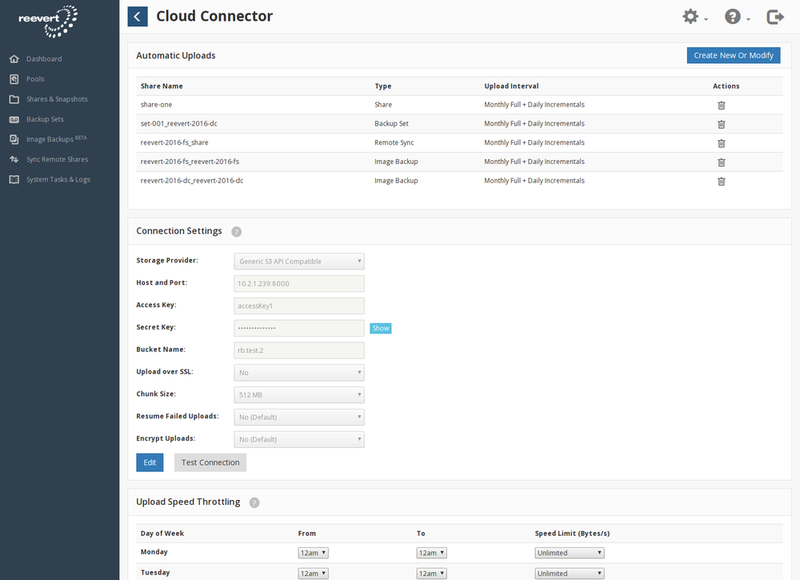 Easily update your cloud connection settings via admin panel. 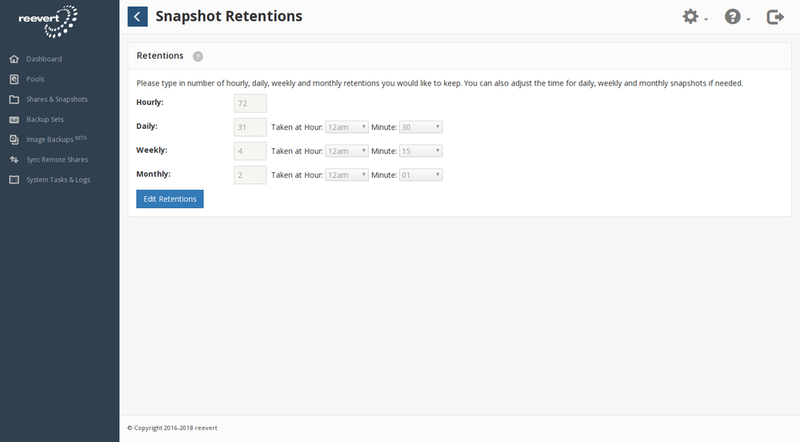 Create snapshot retention settings based on your needs, saving a set number of snapshots hourly, daily, weekly, and monthly. Keep track of system activities. 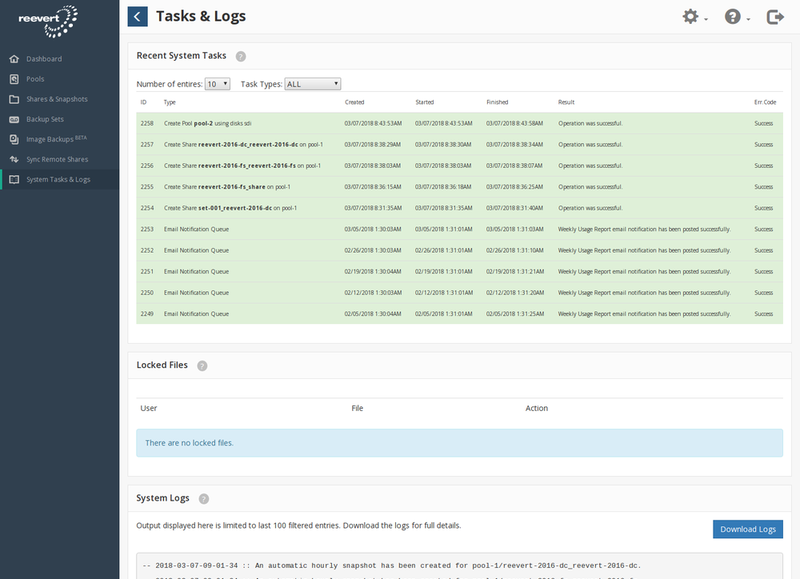 reevert logs all tasks and system logs with the option to download logs for full details. This section enables administrators to change various settings of the appliance, from email notifications to changes to IP address or domain membership.